Disclosure: This is a sponsored post with B-UP Bars and Blog Meets Brand. All opinions are my own. I love trying new kinds of bars and was recently sent some B-UP Bars to try. They are rich in protein with 20 grams per serving, 18-20 grams fiber and only 2-3 grams of sugar. These come in different tasty flavors including Peanut Butter, Vanilla Peanut Butter, PB and J, Sugar Cookie, Cinnamon Roll and Chocolate Mint. When I received my package to try, I was excited to see little sample sizes. These only had 90 calories and 10 grams of protein. I took these two to work the following day for my mid-morning snack. The flavors were the sugar cookie and chocolate mint. Both were very good but my favorite was the sugar cookie. The flavor really did taste like a sugar cookie which was awesome! The bars have a very soft and chewy texture which I enjoyed. They are described as a "nougat marshmallow type bar" and I agree with this description. The chocolate mint flavor was great as well. I like that these are high in protein and help fill me up. They are also very low in sugar which is great- I am always trying to reduce my sugar intake because once I get started eating a daily cookie for example, I do not want to stop! The bars have no artificial flavors, sweeteners or preservatives. B-UP bars are sweetened with stevia and monk fruit extract. They are gluten-free and low in sodium. They do have a large amount of added fiber to offset the carbohydrate amount- do not eat too many at once, especially if you have digestive issues. When people have a lot of fiber at once, you can have stomach pains and bloating. They are rich in protein which can help with building muscle and muscle repair after working out. One bar has 20 grams of protein which is similar to the amount of protein in a chicken breast. How Much Protein to Consume per day? The exact amount of protein that you need is a highly debated topic among experts. Most researchers do agree that endurance athletes need more protein than non-athletes. The recommended daily amount of protein for most people of 0.8 grams protein/kg body weight is not enough for athletes. Protein needs vary greatly depending on how much you are training. For light to moderate training, the Academy of Nutrition and Dietetics recommends 0.55 to 0.8 grams of protein per pound of body weight. For high intensity or a heavy training load, 0.7-0.9 grams per pound are recommended. For example, for a 140 lb female who does moderate training, this would require her to consume 77 to 112 grams of protein per day. These B-UP Bars can be great after a workout to refuel and meet your protein needs. 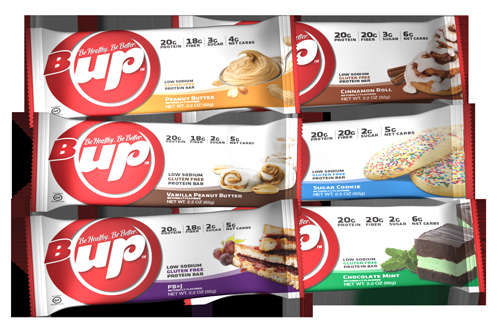 If you want to try these B-UP Bars, you can order a 6 pack trial. This is normally $17.49 but if you use the code yuptrial, you can get this pack for $13.99 with free shipping. For a 12% off discount, use the code yup29 off of box orders (not the trial size).